Symphonies and concertos dominate Erkki-Sven Tüür's catalogue, yet both genres seem curiously irrelevant to the way he actually makes music. His conception of the orchestra is as a monolithic entity, providing a range of interrelated timbres that can be put to the service of rhythmically propulsive but texturally quite straightforward music. The symphony and concerto presented here conform to the conventions of their respective genres to the extent that their scale is appropriate and the latter features solo instruments, but beyond that the terms are little more than names. It is curious, then, that both also have individual names, although neither of these – Strata and Noesis – help us very much either. If anything, the names reinforce the abstraction of the music, an abstraction that even takes it beyond the absolute status suggested by the generic affiliations. Yet there is a strong corporeal element to Tüür's music that balances the abstraction. It is most evident in his writing for percussion. If you know his percussion concerto 'Magma', then you'll know what to expect from the 6th Symphony. Untuned percussion is an almost continuous presence, both grounding and propelling the music. And for the most part, the percussion writing is unrepeatative, a welcome change from the industrial minimalist approach of much contemporary percussion-led orchestral writing. Tüür has a distinctive musical voice, but you will also hear echoes of other composers here. James MacMillan's Veni Veni Emmanuel is often suggested in the percussion writing. The way the rest of the orchestra is treated is usually through clusters or complex chords that gradually accrue over the course of 20 or 30 seconds. This suggests, to me at least, the influence of Alfred Schnittke, and the string wiring in Schnittke's 2nd Symphony is, I suspect, and influence. The overall result is music of monumental power but fairly straightforward construction. Tüür's predilection for titles taken from geological terminology is appropriate to the extent that his music constantly eludes to slow moving processes while always maintaining a sense of groundedness through the ever-present percussion. And while his musical ideas may lack sophistication, they are always well-served by his skill at orchestration. Indeed, the ideas seems to be founded on the orchestral colours used to present them. This is truly idiomatic orchestral music, with every instrument put skilfully to the service of the musical ideas. In this sense, perhaps it is symphonic, although on an extremely abstract level. The concerto Noesis for clarinet, violin and orchestra is a similar work. There is less percussion here and the textures are more linear. Fast modal scales are the basis of most of the textures, calling to mind Ligeti's Melodien. There is percussion and brass aplenty, less perhaps than in the symphony, but more than you will find in most concertos. The two solo instruments are used to their full potential, and given some excruciatingly complex figurations. In general, the clarinet stands out better from the large orchestra than the violin, the reason I suspect that the figurations of the solo violin are often closely replicated by the strings of the orchestra. The brother and sister team of soloists are clearly on top op this music. Both are given a helping hand by the audio to rise above the orchestra, but when they fail to do so, it is clear that the composer intends them to be subsumed. I wonder what Jörg Widmann makes of this music. It is similar to his own in many ways, especially the brittle orchestral textures and the punishing solo parts. But Widmann tends to favour more continuous spans. This music comes in waves, repeatedly climaxing then falling away, where Widmann would be more inclined to keep the textures at an even and sustained level of intensity. Good playing from the Nordic Symphony Orchestra and their young conductor Anu Tali, always precise and measured, but also full-blooded and energised. The Estonia Concert Hall, at least as represented here, appears to have a fairly resonant acoustic. That favours the swirling, hypnotic textures from the strings, but can cause some distractingly long decays on the drums. 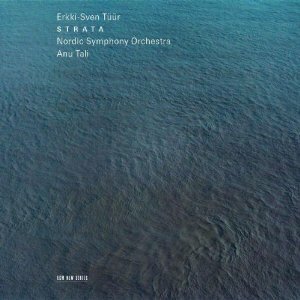 Erkki-Sven Tüür is one of the more aggressive modern composers on the ECM books, and comparisons with their other Estonian signing, Arvo Pärt, are unlikely to yield meaningful insights into either composers' work. But gritty as it is, I'm sure there is an audience for this music. Powerful percussion writing is the common thread running through Tüür's orchestra output. If you've heard that in his earlier works and liked it, then you'll like this too.